These 8 tips will help you take control of your finances - and your life! Are you sick and tired of being sick and tired?!? You live paycheck to paycheck and you are completely over being perpetually stressed about money? Guess what? Your finances are out of control! These 8 tips will help you take control of your finances – and your life! I know exactly how you feel because less than two years ago we were in the very same place. When we totaled up our debt and realized we were $35,000 in debt (with another $20,000 to come later) we felt completely hopeless! Paying off that debt felt like a huge mountain that was insurmountable. But it wasn’t. 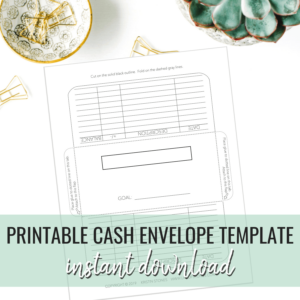 Paying off debt and living debt-free IS completely possible! You just need to take it one step at a time. I want to encourage you to read through this post and find the strength to take the first step. Just one step. Then another. And another. 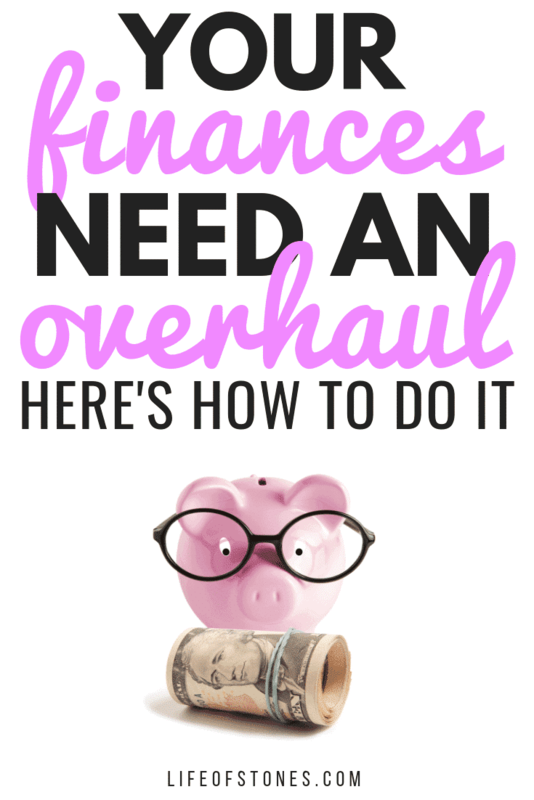 If you’re reading this article, chances are you’re already well aware that you need to improve your finances but maybe you’re feeling stuck on where to begin? Knowing you need to take control of your finances and knowing how to take control of your finances are two very different things! If you’re ready to see major changes in your life – lasting changes – you must actually take the steps to do so! My posts may contain affiliate links for your convenience. This means if you click on a link and purchase an item, I will receive a small commission at no cost to you. See my full disclosure policy for more info. Although this term might be unfamiliar to you, taking “inventory” of your finances is an important starting point. Think of your financial inventory like a snapshot of your finances as a whole. Understanding what you have in inventory – assets, and what you don’t have – debts, can be a pleasant surprise or extremely overwhelming. 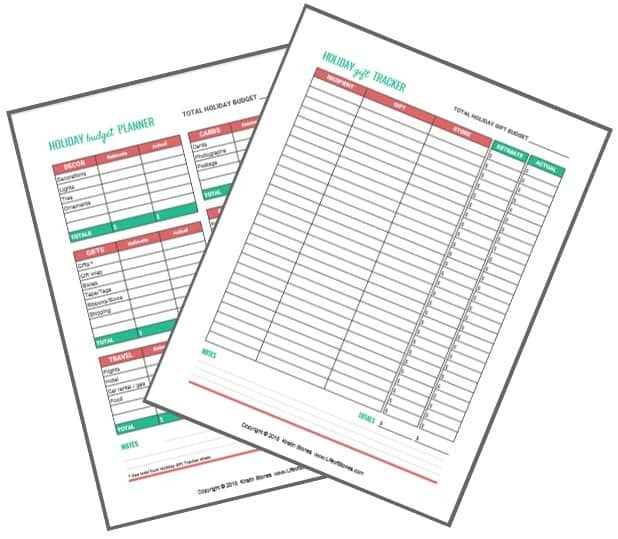 Download your free financial inventory worksheet or grab a notebook and write down every debt you have, along with the balance, and every account you have, along with the balance. Now review this with your partner or an accountability partner. What do you see? How does this make you feel? Really dig in here. Take responsibility, this is the financial situation you have created for yourself. Is it a positive one? If so, great! Way to go, you’ve done a good job! But if it’s not, that’s OK. You are definitely NOT alone. Having a clear picture of your current financial situation will allow you to set goals and create a plan of attack! This is an essential step that cannot be skipped, no matter how scary it may seem, especially if you’ve been down this road before with little success! Let me paint a picture for you… You (and your partner) are miserable. You can never seem to get on the same page and fight all the time about money and it constantly spills over into all other areas of your life. Focusing on financial self-care and improving your finances can change your marriage (or partnership) in ways you can’t even imagine! Your best chances for success are tackling your finances as a team. I know this isn’t always easy. Always come from a place of love. No one wants to feel pressured or bullied. Don’t place blame. This will only put them on the defensive. Take responsibility for your role in your financial mistakes. Be patient. Some people are slower to take action and might need more time to think! Dare to dream. Talk about your future together and what you’d like to achieve as a couple and family. This will help you feel united. Then it may be easier to discuss how you can get there…together! Simply by reading this article, you are seeking help, and that’s a great start! However, you are going to need some “real-life” help as well! Having someone (other than your spouse/partner) to support your efforts can be crucial to your success! You will have days where you want to veer from your plan and you will have days where you want to throw in the towel and give up altogether. Having someone in your corner cheering and encouraging you can make a world of difference! If you feel as though you don’t have anyone in your family to fill this role, expand your circle. Look for a co-worker, fellow parishioner at your church, or even a mommy (or daddy) friend at school or playgroup! Be sure to check in with them often so they can advise you, help you make tough decisions and walk with you through hard times! 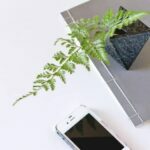 The thought of living on a budget and tracking every dollar you spend can seem incredibly daunting. Trust me when I tell you that a budget is your most important tool for taking control of your finances. I know it can feel stifling and restrictive, but I promise you, it is not. A budget offers you control. Control over how you spend (and save) your money, instead of your money controlling you! A budget allows you to tell your money where to go. It allows you to give it an assignment each month instead of blindly spending with no direction. And here’s the thing….YOU get to decide what to put in your budget. If a vacation is your priority this year…put it in your budget! Want to grab dinner with friends each weekend…put it in your budget! 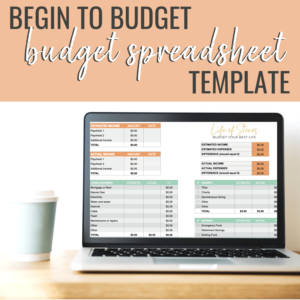 Download your free budgeting worksheets and sign up for my Begin to Budget 5-day email course below (it’s completely free!) and get started creating your first budget right away. Budgeting takes time and practice so be sure to give yourself about 90 days to really find your groove and give yourself grace…because mistakes will happen! If you’re just getting started on fixing your finances, you need a plan! Finding a financial plan that resonates with you is like having a roadmap straight to financial success! For us, the Baby Steps System just spoke to us. Taking this incredible course made us feel empowered to finally take back control of our finances! There is no shortage of financial gurus to follow, each having their own personal system for financial success. The good news is that most of them will work – if you do the work – but it is imperative to find a system that resonates with you. Once you embark on your new financial plan remember, these proven systems are tested. They are tried and true, so be in the beginning, following the system closely will be beneficial! Further on in your journey to take control of your finances, it’s important to remember that while the experts are experts for a reason, personal finance is personal. This means that one size does not fit all. And at the end of the day, your financial decisions are your responsibility! I firmly believe that setting smart, aggressive goals is so important when improving your finances. There are no “right” or “wrong” goals but using this proven system to set your goals will help you stay accountable to them every step of the way! Setting goals has many benefits including increased motivation and productivity, mental clarity, and a sense of accomplishment. Not to mention, goal-setting can even make you a happier person! Consistently monitoring your progress can be extremely motivating! The key here is to understand how you best learn and monitor your progress accordingly. Let me explain…personally, I am a very visual person. So tracking my progress using visual tools helps me stay excited about our future and focused on our financial goals! If you’ve taken this course before then you can hang the progress tracker on your wall. Choose a place where you will see it often because keeping your goals in the forefront of your mind will ensure you stay on track! Using a customizable savings tracker is another great tool for visual learners! If you are a verbal person then physically writing out your goals or using a calendar to track your habits would be an effective method to evaluate your progress! Essentially you just need to find a way of tracking that aligns with your personality because you will be more likely to stick with it! The final step to taking control of your finances is to consistently review and revise your current financial situation at regular intervals. This means you must remain present in the financial aspects of your life. It’s not enough to set goals, make some big declarations, create a budget and then check-out. At this stage of the game, you cannot yet set your finances on autopilot. You must be checking your accounts, updating and reconciling your monthly budgets and having regular budget meetings with your partner. It is imperative that you remain an active participant throughout the process! 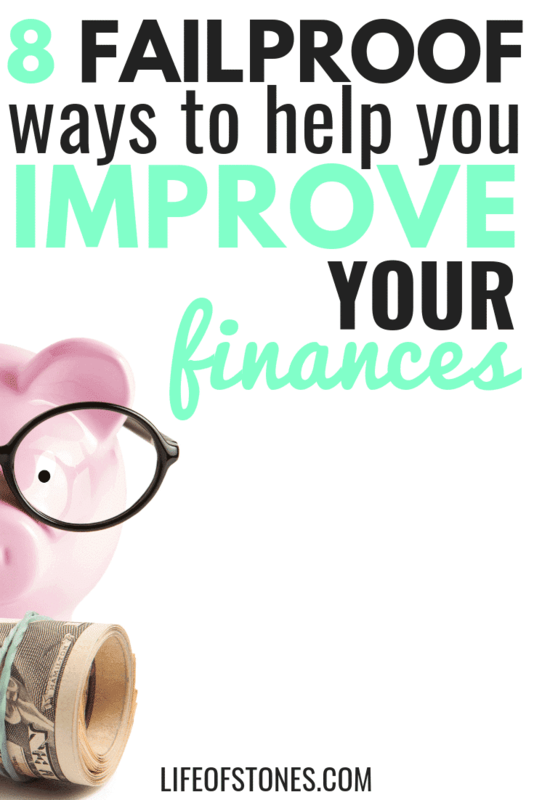 Not only will it strengthen the new financial habits you are trying to build, but it will ensure you catch any mistakes before they occur and allow you to become more familiar with your finances all around. Following these 8 steps to improving your finances will most definitely lead to many positive changes in your financial life! Make the commitment and show up for yourself because you deserve to lead a life of abundance, not lack, and no matter how hopeless things may seem right now – it is POSSIBLE – if you’re willing to put in the work!